Complete the Registration Information at the bottom of this page. 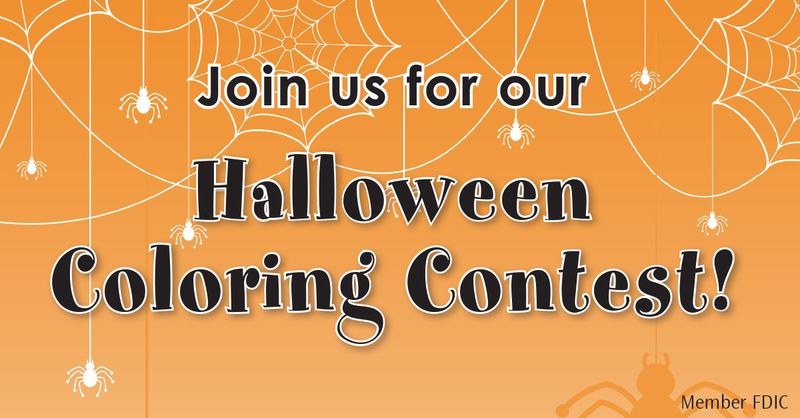 Merchants Bank locations participating in this year’s Halloween Coloring Contest include: Cannon Falls, Cottage Grove, Rosemount, Winona-Downtown, Winona-Goodview, Winona-Lakeside. And, because you and all of our young savers are important to us, we’ll have a special Halloween treat waiting for you for returning your entry. We look forward to seeing you and don’t forget to tell a friend about our Halloween coloring contest! *Please submit entries by October 28, 2016. Judging will take place on October 31, 2016 at 4:00 p.m. Three age groups: 0-5 years, 6-9 years, and 10 years and older. A prize will be awarded to each age group. No purchase or customer relationship necessary to enter or win. One entry per person. Winner will be notified by telephone. Children of Merchants employees are not eligible to win. This entry was posted in Current News, Uncategorized and tagged coloring contest, Halloween, Merchants Bank. Bookmark the permalink.